Time is money, and managing your wealth can be overwhelming. At Wealth Strategies, LLC, our goal is to assist clients, manage their assets, and help simplify their lives. The process of organizing, evaluating and utilizing financial resources. At Wealth Strategies, LLC, we will help you to define and achieve your life goals. Rising education costs require a forward-thinking plan. Wealth Strategies Group, LLC can help you prepare for one of life's biggest investments. 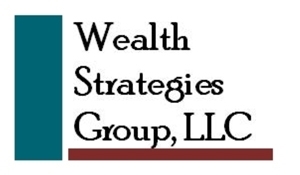 Wealth Strategies Group, LLC is an independent, comprehensive financial services firm. Our mission is to reduce your stress and provide simplicity. We help you finish the job by guiding you through the process of identifying and achieving your financial goals, making the most of all your hard work and sacrifice up to this point. The financial planning and investment advisory business is just as much about relationships as it is about dollars and cents. We build relationships with clients based upon shared values, treating clients like family and friends. We take the time to explain everything so you feel comfortable, confident and in control of your money. We work with many of the finest financial institutions in the world today in order to obtain the products and services that fit our client’s needs. Our customized programs are designed to diversify, and manage your wealth while delivering a high level of personalized service. Wealth Strategies Group, LLC maintains professional associations, memberships, and designations that ensure we are always up-to-date on any changes within the industry, tax and estate legislation, and investment programs. Planning for retirement? At Weath Strategies Group, LLC we are here to answer your questions and help you navigate the maze of planning for your future. We provide a system to identify your desires, assess your risk tolerance, and identify the options to reach your goals. We provide a plan designed around your needs and comfort levels. Already retired? Will you outlive your assets? At Weath Stragegies Group, LLC we continue to monitor your plans and investments with regular updates to determine if adjustments are needed. Regular investment reviews along with plan updates can provide you with the necessary information you need to maintain your lifestyle.